A Little Diamond: It Looks Like a Q. Looks Can Be Deceiving. 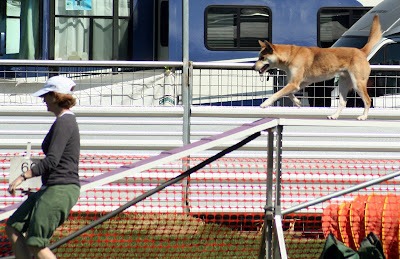 My friend Vickie just sent me these pictures from an agility trial a few months back. Frankie looks like a superstar in these photos. I'm amazed that Vickie got photos with both me and Frankie in them. 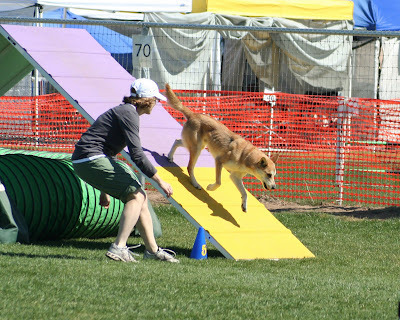 Usually I'm left standing by the A-frame and Frankie is zooming off 80 feet away going through a tunnel. But here, it appears as if Frankie is on-course. And he's getting a good solid contact - woo-hoo! This one is particularly impressive because I am in front of Frankie. He hadn't yet left me in the dust. 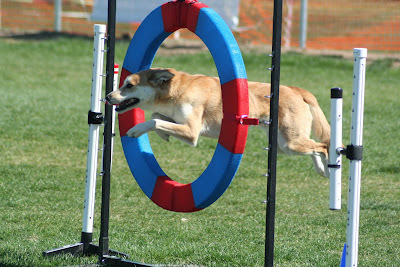 Or more likely, he had already finished zooming around his whole idea of a course and finally came back to be nice and let me have my turn at deciding where to go. And after all those zoomies, he must have been too tired to keep up with me. 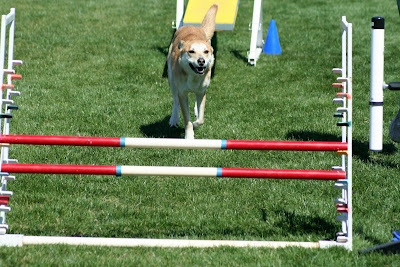 Here he is, lickety-split off that teeter and over the jump to finish. It sure looks like a Q from the photos! I don't remember the exact results from this trial, but since we never Q, I'm pretty sure this run wasn't a Q. At least he looks good! You are always a Q in my book.